In this photo retouching tutorial, we're going to look at how simple and easy it is to change hair color in Photoshop by tinting and colorizing someone's hair in a photo. The technique we'll be learning here gives us complete control over what we're doing, with several different ways of fine-tuning the results, plus we can also go back any time we want and change the hair color without having to redo all the work! You can use this technique on photos of other people (friends, family, clients), or you can even use it on a photo of yourself to see how different hair colors would look on you! At the end of the tutorial, we'll see how easy it is to go back and change the color to something completely different. As soon as you select the Colorize option, you'll see your entire image become colorized with a shade of red. Drag the Hue slider left or right to select the color you want to use for the person's hair. For the moment, you'll be colorizing the entire image, but we'll fix that in the next couple of steps. Just ignore the rest of the image for now and focus only on the hair. Once you've found a color you like, adjust the intensity of the color by dragging the Saturation slider left or right. Dragging it to the right gives you a more saturated color, while dragging it to the left reduces the saturation. Use the Hue slider to select a new color for the hair and adjust the intensity of the color with the Saturation slider. The entire image is now colorized in red. One of the great things about adjustment layers in Photoshop is that each one automatically comes with its own layer mask, and we're going to use it to fix the problem we currently have with our entire image being colorized when all we really want is for the hair to be colorized. To start with, let's completely hide the effects of the Hue/Saturation adjustment layer by filling its layer mask with black. Since black is our current Background color and the layer mask is already selected (Photoshop automatically selected the layer mask for us when we added the adjustment layer and set our Foreground and Background colors to white and black, respectively), all we need to do is use the keyboard shortcut Ctrl+Backspace (Win) / Command+Delete (Mac) to fill the layer mask with black. The Layers palette showing the layer mask thumbnail for the Hue/Saturation adjustment layer now filled with black. Photoshop's Tools palette showing white as our Foreground color and black as our Background color. We also already have our layer mask selected, and we can tell that because the layer mask thumbnail in the Layers palette has a white highlight border around it, as shown in the image for Step 4 above, which tells us that the mask is selected. 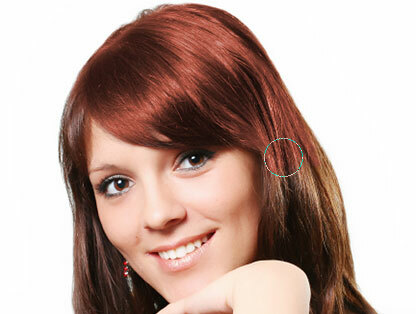 Paint with white over the hair to reveal the colorizing effect from the Hue/Saturation adjustment layer. Lowering the opacity of the brush in the Options Bar. Zoom into the areas of loose strands if needed and paint over them a couple of times with a lower opacity brush. Press Ctrl+Alt+0 (Win) / Command+Option+0 (Mac) when you're done to zoom back out to 100%. The woman's hair is now colorized while the rest of the image is not. We'll look at how to fine-tune the effect next! Step 7: Change The Blend Mode To Either "Color" Or "Soft Light"
Change the blend mode of the adjustment layer to either "Color" or "Soft Light". The image with the blend mode of the adjustment layer set to "Color". Only the color of the hair is being affected. The lightness values in the hair are not being affected). The image with the blend mode of the adjustment layer set to "Soft Light", giving us a more dramatic effect. Choose the blend mode that works best with your image. Lower the opacity of the adjustment layer for a more subtle colorizing effect. The image after lowering the opacity of the adjustment layer. Double-click on the adjustment layer's thumbnail to edit the Hue/Saturation settings and change the hair color. Adjust the Hue slider to change the hair color again. Setting the blend mode back to Color and raising the opacity to 75%. The image afterChanging the hair color and saturation, blend mode and opacity value. And there we have it! That's how easy it is to change someone's hair color in Photoshop! Check out our Photo Retouching section for more Photoshop image editing tutorials!